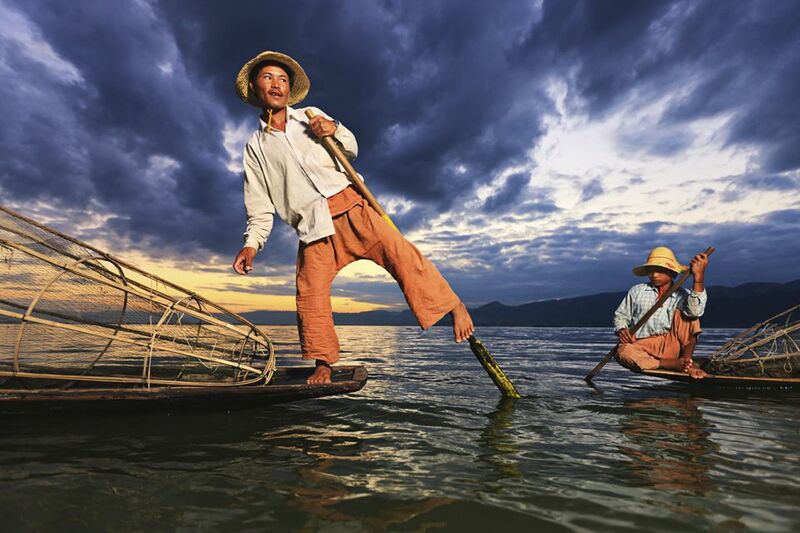 Water, mountains and an endless sky: Inle Lake's natural gifts have been a quiet tourist draw for decades (even before Myanmar opened up to the outside world); these have made Inle Lake one of present-day Myanmar's hottest destinations. But "hot" is relative; even popular Inle Lake still feels off-the-beaten-path for first-time tourists visiting Myanmar. Beyond the famous one-legged rowing fishermen and the lake waters that seem to go on and on (particularly when riding a speedboat out of Nyaungshwe, the gateway to Inle Lake), you'll find the following adventures waiting for you once you get out of the boat. The ordinary house cat looms large in Burmese culture. Every house in Inle Lake has a pet cat. If you've been missing Tabby back home, Inle Lake lets you cope in one of two ways. For fun cat tricks, visit the Nga Phe Kyaung Monastery, popularly known as the "Jumping Cat Monastery" due to the monks' training the cats to jump through hoops. Today, shows are rare or nonexistent, but the cats still remain, getting fatter from lack of exercise. Combine a visit to the sanctuary with lunch at the attached restaurant at the Inthar Heritage House to make a visit a whole-day affair. It's not as jam-packed with stupas as Bagan, but Inle Lake allows you to experience Myanmar's Buddhist culture in its own unique way. Begin with Inle Lake's most-visited house of worship, the Hpaung Daw U Pagoda. This temple in Ywama village houses five golden Buddhas, each rendered unrecognizable from layers upon layers of gold leaf. For more information, read this article about visiting Hpaung Daw U Pagoda. The Shwe Indein Pagoda is far more atmospheric. It's actually two groups of stupas in Shwe Indein village that date back as far as the 8th century. Both are readily accessible from the single 2,300-foot covered walkway that stretches from a jetty on Indein Creek to Shwe Indein temple with its single golden Buddha. The group closer to the creek - Nyaung Ohak - seems abandoned to the elements, bearing no signs of any restoration work whatsoever. Crumbling from neglect, some of Nyaung Ohak's stupas have trees growing out of the top. The Shwe Inn Thein group looks newer: some stupas in this group have been subjected to some rather overenthusiastic restoration that removes any historical traces whatsoever. Min, my host at the Thahara Inle Vintage, only recommends this experience for guests staying over three nights. "If you go there, you stay the whole day," Min tells me. "You start at 7 am and come back in the evening." What's in store at Sagar? Travelers will find a ruined capital that predates Nyaungshwe; this was the seat of the local king (Saopha) before he moved to Nyaungshwe. A hundred "sunken stupas" is almost all that remains of this city, now submerged in the lake's waters. Nearby villages inhabited by Pa-O tribespeople - Sae Khaung and Tar Kaung - are famous for their rice wine and pottery cottage industries, respectively; both places allow visitors to watch the production process using traditional methods. Active travelers can hit one of the many biking and hiking trails that wind out from Nyaungshwe, passing by pleasant countryside and bucolic Burmese villages. The bike trail from Nyaungshwe to the Red Mountain Winery is one not to miss: a pleasant two-mile jaunt leading gradually uphill until you reach a winery set amidst Inle Lake's surrounding hills. Once you arrive, you can book a wine tasting session that lets you sample the fruit of the local vineyard: a sweet Sauvignon Blanc, a Shiraz-Tempranillo blend and a white wine blended from Sauvignon Blanc and Muscat Petit Grain. Don't discount the fun of just canoeing through Inle Lake's village waterways and watching the people going about their business. Not everybody goes about using speedboats. For shorter distances, Inle villagers prefer to use canoes, paddling from school to market to home at a leisurely pace. Most important places are built right over the water, either on stilts or on the shore. You'll see groups of kids canoeing to school, with no adult supervision. Nothing to worry about, says Min: "By age three or four, they know how to swim already!" If you want to go shopping for souvenirs in the local villages (read about Myanmar kyat), your boatman will be happy to oblige: you'll be taken to crafts villages like Ywama (for silver), In-phaw-kon for a linen-like cloth made from lotus fibers; and Nam-Pan for cigars, knives, and wooden handicrafts. But for a more authentic shopping experience, ask your hostel, hotel or resort about market day in a nearby town. Each town usually holds market day once every five days: in Ywama, for example, the market sets up at a field just outside Hpaung Daw U Pagoda. They have everything: souvenirs for the tourists, meat, and vegetables for the housewives, DVDs for movie fans and even cheap electronics! These gardens simply rise above the monsoon season floods; bamboo poles were driven into the lakebed keep the gardens secured in one place while permitting up and down movement based on the water level. Constant replenishment of organic matter from the lakebed keeps the crops healthy. And obviously, irrigating the farms will never ever be a problem.